Sorry for the lack of posts. I've been so busy sewing, painting, and crafting all sorts of things that I haven't had time to blog! I do have time to share a handmade gift I whipped up for the Craftaholics Anonymous Handmade Gift Exchange. I think this is my 4th time participating in the exchange. Its fun to connect with other crafters and to give and get a unique handmade gift. I shipped off my gift last week so hopefully my giftee has received it and this post won't ruin the surprise. I've been wanting to try making a freezer paper stencil with my Silhouette Cameo. 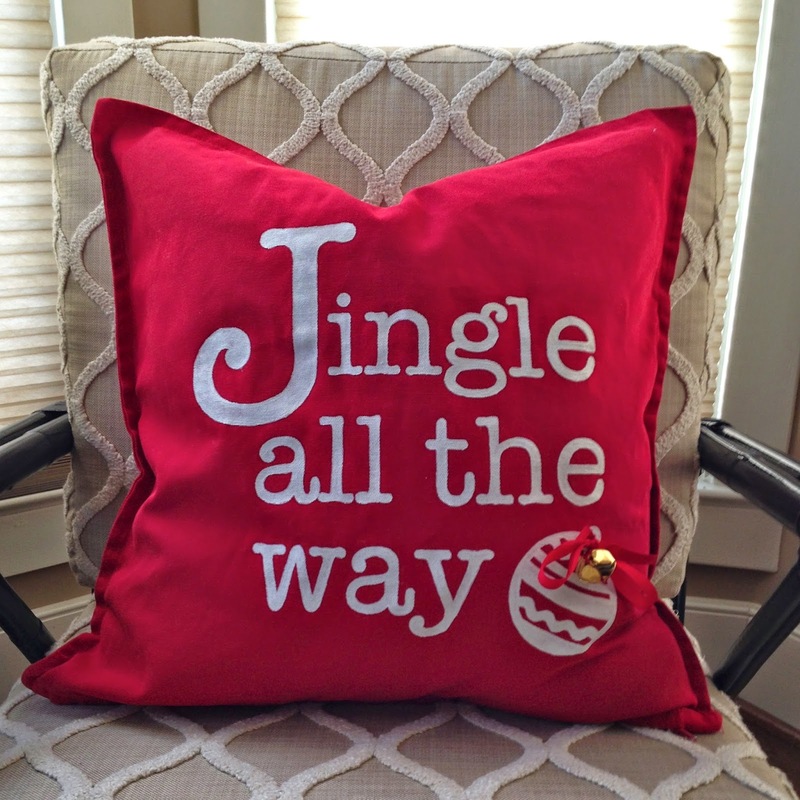 When I spotted solid red pillow covers at Ikea, the perfect Christmasy project came to mind. I found some great tips and advice for cutting and using freezer paper stencils in this post from The Thinking Closet Blog. I used the American Typewriter font for the lettering. The stencil worked pretty well. Unfortunately the pillow cover fabric is textured and some of the paint seeped under the stencil. My husband said he couldn't see what I was talking about, but it bothered me enough that I used a paint brush to clean up some of the edges by hand. I sewed the bow and bell on to the pillow using a thick quilting thread. I went back to Ikea this week and picked up two more pillow covers to dress a couple of pillows in my own home for the holidays. I'll post pics of those pillows on Instgram - follow me there @mandyfarn.